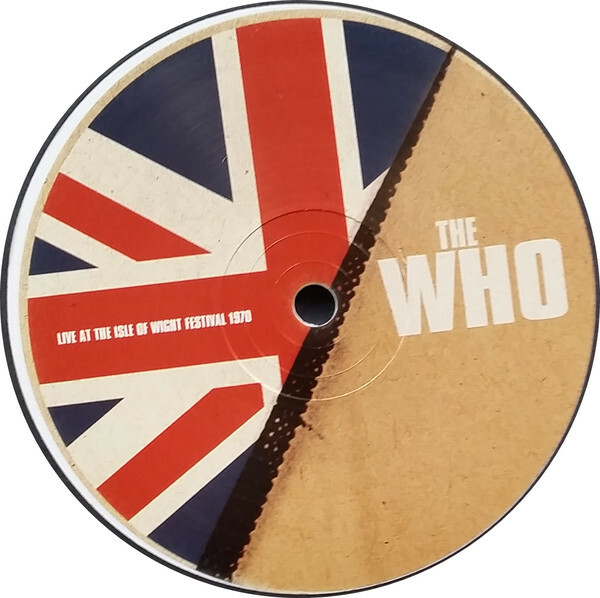 THE WHO-LIVE AT THE ISLE OF WIGHT VOLUMES 1 AND 2 RECORD STORE DAY 2018 EDITIONS. During the late-sixties and early seventies, some of the most famous festivals took place and become part of musical history. By then, festivals were well established, with jazz fans attending many historic festival since the fifties and early sixties. This included the Newport Jazz Festival in Rhode Island, the Beaulieu Jazz Festival, the National Jazz and Blues Festival and the Reading and Leeds Festivals which were founded in 1961. They would become part of rock history later in the sixties. By 1966, psychedelic music was growing and popularity and the Trips Festival took place in San Francisco between the ‘21st’ and ‘23rd’ of January. During the event Ken Keesey carried out his infamous Acid Tests at the Trips Festival. It was the first of several similar types of festivals. This included the Mantra-Rock Dance and Fantasy Fair and Magic Mountain Music Festival which took place during 1967. So did the Monterey Pop Festival took place between the ‘16th and ‘18th’ of June 1967. Among the artists and groups that took to the stage were the Jimi Hendrix Experience, The Who and Ravi Shankar who were making their first appearances at major even in America. The audience also witnessed the first performance by Janis Joplin and Otis Redding at such a large-scale public event. Those in the audience were watching musical history being made. It was similar case at the 1967 Monterey Pop Festival and Schaefer Music Festival in Central Park New York. However, the popularity of festivals was about to explode. In 1968, the Newport Pop Festival became the first covert to have more than 100,000 paid attendees. Meanwhile, in Britain, the very first Isle of Wight Festival was held in 1968. However, in America many major cities had their own festival during 1968. This included the San Francisco Pop Festival, Los Angeles Pop Festival and the Miami Pop Festival which took place between the ‘28th’ and ‘30th’ of December and rounded of what was a vintage year for festivals. So was 1969, as the amount of concerts beings staged grew. This included the Newport 1969 Pop Festival took place between June the ’20th’ and ’22nd’ 1969. The same weekend, the Toronto Pop Festival took place during the Summer Solstice and following week, Led Zeppelin and Fleetwood Mac starred at the Bath Festival Of Blues. Across the Atlantic, the historic Denver Pop Festival took place the same weekend. It seemed that there was a festival every weekend during the summer of 1969. This included Mississippi River Festival and the first ever Atlanta International Pop Festival. However, on the ‘5th’ of July 1969, The Stones In The Park took place in front of an audience of between 250,000 and 500,000. This was just after the mysterious death of former Rolling Stone Brian Jones. Despite this tragedy The Stones In The Park became part of rock history. It was a similar case with 1969, when The Woodstock Music and Art Fair which featured some of the biggest names in music. This included The Grateful Dead, Sly and The Family Stone, Jefferson Airplane, The Band and Jimi Hendrix who closed what was an eventful and sometimes chaotic festival. Most festivals passed off without any problems including the Texas International Pop Festival and Toronto Rock and Roll Revival which featured John Lennon and Yoko Ono. However, as the sixties drew to a close this changed. The Palm Beach Pop Festival was chaotic, while violence and three deaths marred the Altamont Free Concert which was attended by 300,000 people. The final festival of the sixties was the Miami Rock Festival which took place between the ‘27th’ and ‘29th’ December and there were forty-seven arrests and a member of the audience died after falling from a spotlight tower. It was way to end the sixties. Despite there being chaos, violence and sometimes even deaths at concerts, still people wanted to attend concerts during 1970. New festivals were founded, old ones expanded and some made a welcome return. This included the second Atlanta International Pop Festival, the Bath Festival of Blues and Progressive Music and the third Isle of Wight Festival. Isle of Wight Festival 1970. The third Isle of Wight Festival took place between Wednesday the ’26th’ and Sunday ’31st’ of August 1970. Between 600,000 and 700,000 made their way to the Isle of Wight Festival to watch a lineup that featured a mixture of new names and the great and good of music. During the first day, progressive rockers Judas Jump, singer-songwriter Kris Kristofferson and the psychedelic rock band Mighty Baby took to the stage. However, problems with the PA meant the audience couldn’t hear the singer who was the first of several artists to be booed. On Thursday the 27th’ of August 1970 Supertramp, Terry Reid, British blues rockers Groundhogs and progressive rockers Gracious entertained the audience. However, some of then higher profile artists arrived the following day. This included Taste who featured Rory Gallagher who took to the stage on Friday the ‘28th’ of August 1970. Just like Chicago, and Family they were regarded as rising stars of music. Meanwhile, Tony Joe White had already enjoyed several hits, but was nowhere near as successful as Procol Harum who were one of the biggest names on the third day. The lineup on Saturday the ‘29th’ of August 1970 was star-studded. It included Joni Mitchell who played a controversial set. Later, Miles Davis, Ten Years After, Emerson, Lake and Palmer and The Doors took to the stage. While they received a rapturous reception, many in the audience were waiting for one particular band…The Who. When The Who took to the stage at The Isle Of Wight Festival, they were one year and three months into their Tommy tour. They had released Tommy on the ’23rd’ of May 1969 and watched as it reached number two in Britain and four in the US Billboard 200. This resulted in Tommy being certified gold in Britain, France and Italy and double platinum in America. Despite the success of Tommy, The Who continued to tour the album, and the latest stop on the tour was The Isle Of Wight Festival. 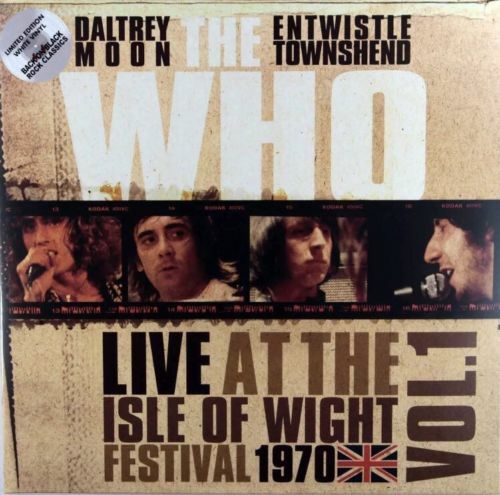 This was the second time The Who had played at The Isle Of Wight Festival since it began in 1968. However, this time the tapes were running, and their performance which included their 1966 rock opera Tommy and some of their best known songs was being taped. It meant that The Who and their management could release a live album in the future. This took twenty-six years, before Live at the Isle of Wight Festival 1970 was released as a two CD set by Columbia Legacy on the ’29th’ of October 1996. Twenty-two years later, Live At The Isle Of Wight Volume 1 and Live At The Isle Of Wight Volume 2 were released on white vinyl by the Rock Classics label for Record Store Day 2018. Volume 1 which is a two LP set features just twelve tracks, while Volume 2 is a single album and features just six song. These two albums feature part of The Who’s performance at the Isle of Wight Festival in 1970, and are a reminder of a famous performance at a famous festival. Live At The Isle Of Wight Volume 1. 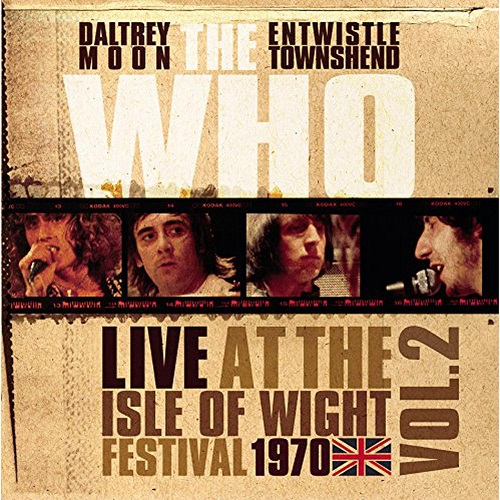 The Who opened their performance at Isle of Wight Festival 1970 with Heaven and Hell, which gives way to I Can’t Explain and a six-minute cover of Mose Allison’s Young Man’s Blues which closes side A.
I Don’t Even Know Myself opens side B and features Water and Overture, which opens their rock opera Tommy. It continues on side C with The Who classic It’s A Boy, then 1921, Amazing Journey, Sparks, Sonny Boy Williamson’s Eyesight To The Blind (The Hawker) and Christmas which close side C.
Tommy continues on side D with The Acid Queen, before the compilers deviate from the original track listing of Tommy. On Live At The Isle Of Wight Volume 1 a blistering version of Pinball Wizard comes before Do You Think It’s Alright and Underture is omitted. Instead, The Who breeze through Tommy Can You Hear Me? and There’s A Doctor, Go To The Mirror! and Smash The Mirror. Sensation, Sally Simpson and Welcome are all omitted from the set, but Miracle Cure, I’m Free, Tommy’s Holiday Camp and a defiant version We’re Not Gonna Take It is extended to nearly ten magical minutes and is a memorable reminder of The Who at The Isle Of Wight. However, in footballing parlance it’s only halftime. Live At The Isle Of Wight Volume 2. After playing the majority of Tommy, Live At The Isle Of Wight Volume 2 features some of The Who’s favourite songs and their greatest hits. They open this part of the set with Summertime Blues which is synonymous with Eddie Cochran. However, The Who’s barnstorming version offers something different. It’s a similar case with the medley of Shakin’ All Over, Spoonful and Twist and Shout which gives way to Substitute which closes the first side of Live At The Isle Of Wight Volume 2. 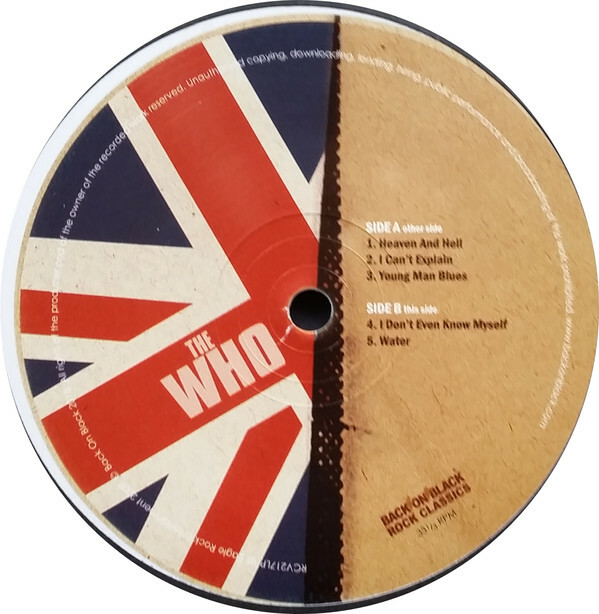 The B side explodes into life with the The Who classic My Generation, and is followed by Naked Eye which is a welcome and some might think surprising addition. It first appeared on The Who’s 1974 album Odds and Sods. However, closing Live At The Isle Of Wight Volume 2 is a blistering versions of Magic Bus, before The Who take their bow. The Who had released sixteen live albums before the Rock Classics released Live At The Isle Of Wight Volume 1 and Live At The Isle Of Wight Volume 2 for Record Store Day 2018. 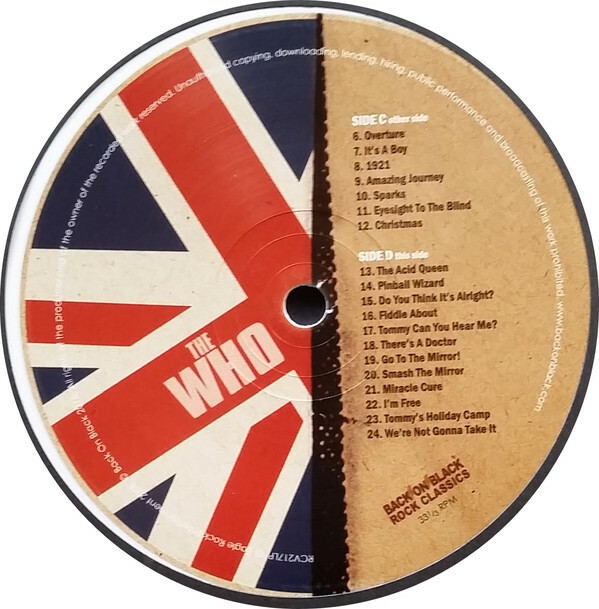 However, these two LPs which are limited editions that were pressed on white vinyl, feature The Who making musical history. This was their second performance at The Isle Of Wight Festival since it was founded in 1968. It was also The Who’s best performance at The Isle Of Wight Festival. Across six sides of vinyl, The Who play some of their greatest hits, favourite cover versions and the majority of their 1966 rock opera Tommy. They had been playing roughly the same set for fifteen months, but when they took to the stage at The Isle Of Wight Festival were revitalised and show just why by 1970 The Who were regarded as one of the best British rock bands. Anyone who doubts this should checkout Live At The Isle Of Wight Volume 1 and Live At The Isle Of Wight Volume 2, which is proof, as if any was needed.